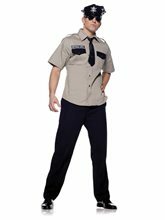 Corporal Punishment Solider Adult Costume.Age Category - Adult.Includes: Shirt, Mask, Bandolier and Inflatable Harness.Available Size: Mens - Standard, Mens - XLarge.Standard: Chest (38"-46"), Waist (26"-36"), Inseam (33")XLarge: Chest (50"), Waist (42"-46"), Inseam (33")*Weapon and Shoes Not Included.Product Care: Hand Wash Cold Separately, Do Not Bleach, Line Dry, Cool Iron if Necessary, Do Not Dry Clean.The Corporal Punishment costume includes a camouflage shirt with skull insignia patch, inflatable shoulder harness, bandolier, and oversized latex soldier mask. Bring on the enemy. He is waiting’! 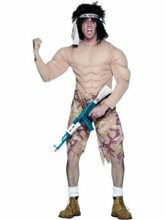 Muscleman Adult Costume.Includes: One muscular body with a short-joint and matching headband. 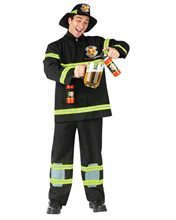 Available Size: One Size Fits Most Adults and Teens. 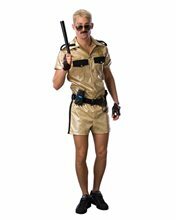 *Hiar, Weapon, Socks and Shoes Not Included. Sold Separately. 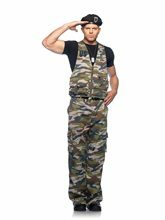 Be idol of the ladies with the Hollywood Muscleman Rambo Costume and TV. 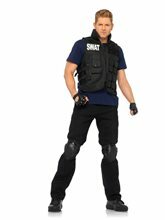 The costume comes with a muscular body with a short-joint and matching headband. Are you ready to lead the party?